Winter snows are already piling up in the Teton, Centennial and Lost River mountain ranges. Migration toward winter range isn’t far away for mule deer, elk, pronghorn antelope, bighorn sheep, mountain goats and moose. For these large mammals, called ungulates, migration isn’t an option, it is a necessity. Snow will soon close some migration routes. Summer ranges will become enveloped in the shimmering whiteness that will help produce the greens of next summer, but it won’t be winter habitat. 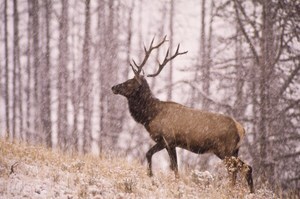 Increasingly, biologists and planners are recognizing that winter range and breeding/summer range, while essential, are only part of the annual life history of most migratory ungulates such as these. Corridors link these essential habitats, and without them, neither one is worth a dang. For instance, pronghorn antelope migrate to Pinedale, Wyoming to escape the deep winter snows in Jackson Hole. A journey of over 100 miles, this is the longest remaining migration of any species in the Greater Yellowstone Ecosystem and archaeological evidence indicates it has been occurring for at least 6,000 years. Before citizens and government acted, this migration corridor had been necked down to a choke point less than half a mile wide and was threatened with further development that could have been disaster for these pronghorn. A more tragic example was the completion of Interstate 84 connecting Magic Valley to Tremonton, Utah. Without built-in wildlife crossings, the interstate stymied access to winter range for thousands of mule deer and destroyed most of the herd. Research has made it clear that migration isn’t always the most direct route or accomplished in the fastest time. If conditions allow, migrating animals loiter on their way to winter range, stopping at their favorite places to rest and to refill energy reserves. In bird lingo, these areas are called stopover habitat, for big game they are often referred to as transition range. In springtime, it is common for big game animals to stop, or stage, in areas where new green grasses are emerging. They may stay in these areas, following the green-up, for several weeks. Here they recover from winter and expectant mothers get the added nutrition needed for growing fetuses. During fall migration, big game animals stage on transition ranges as a final opportunity to gain fat reserves needed to help them survive the winter. Forage on winter range is essential, but ungulates have wintertime physiological and behavioral adaptations to reduce energy requirements and these include eating less and moving less. They depend upon both stored fat and forage to carry them through the winter. Birds have one advantage over big game species. Their stopover habitat can be spotty, existing as islands within development. So long as places like Market Lake Wildlife Management Area and Camas National Wildlife Refuge are adequately spaced, the intervening habitat can be a desert, ocean or a city—they just fly over it. For animals that must walk to their seasonal ranges, it is very much about the journey and not just the destination. Protecting the habitat that connects the dots is as important as the ranges themselves. Big game will soon start moving toward winter range. If conditions allow, they will stop along the way for one last chance to fatten up for the winter.